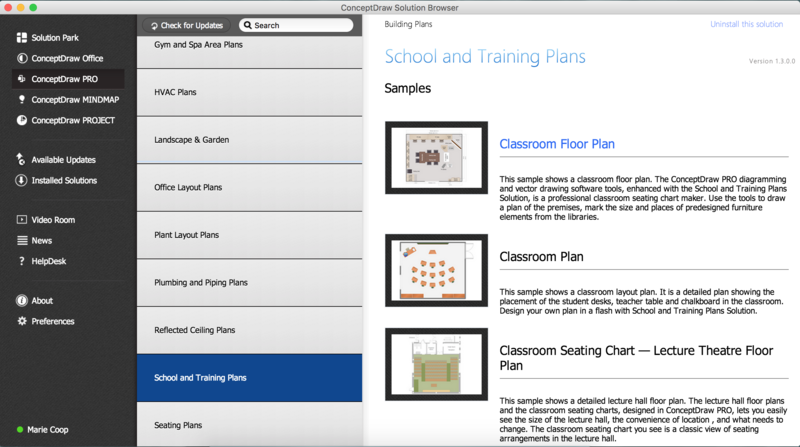 ConceptDraw has examples and templates for designing School and Training Layout. Use it to develop the equipment layout of School or Training Office. School and Training Plans Solution from ConceptDraw Solution Park provides vector stencils libraries with for drawing School and Training Plans. Use ConceptDraw DIAGRAM diagramming and vector drawing software enhanced with Building Plans Area to draw your own floor plan, design, furniture and equipment layout of School or Training Office. The Floor Plans solution from the Building Plans area of ConceptDraw Solution Park includes the 15 vector stencils libraries with 666 symbols of interior design elements, furniture and equipment for drawing economy and limited service hotels and bed and breakfast floor plans and space layouts using the ConceptDraw DIAGRAM v12 diagramming and vector drawing software. Infrastructure is very important part of any district, and educational buildings presence is one of the factors. Another not less important thing is the school design, because it influences the children's’ sense of aesthetics. To develop a harmonic school layout, use a proper software. 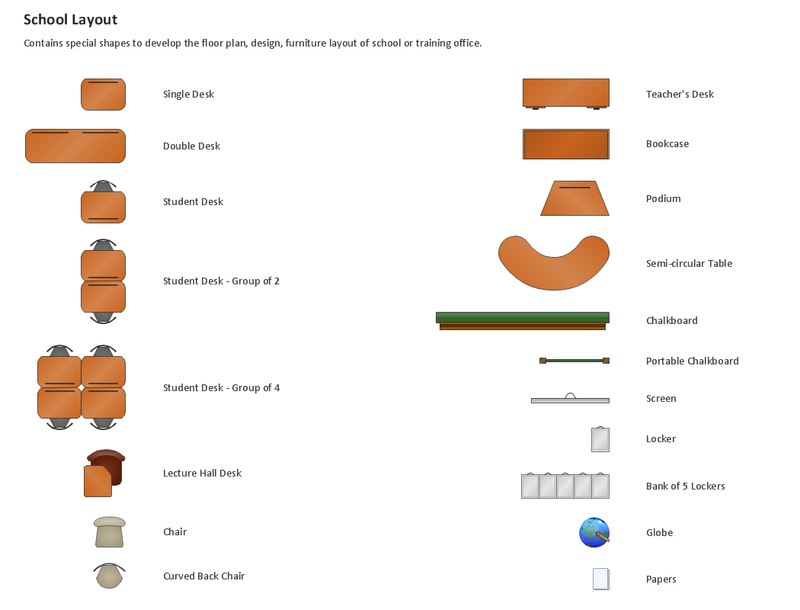 This image represents the School layout library that is supplied with ConceptDraw School and Training Plans solution. The library contains a set of vector graphic objects that will be in help while drawing a layout of classroom. Any lecturer desires to organize the layout of the classroom for the best student advantage. Students must be focused and be engaged in the learning process. The classroom places organization is an important element of a students learning. It is significant for a lecturer to set up a classroom layout and change it time to time to support lectures, to invoke disputes or solve any organizational issues. By using ConceptDraw DIAGRAM v12 you can easily plan how to re-arrange the desks in the class room to maintain visual control of your class and build a friendly environment in the classroom. ConceptDraw Office Layout Software for creating great-looking design. Even if you design a network for yourself, you still might need a network diagram software to do it in a convenient way. Your laptop, or PC, a smartphone and a router form a home area network, which might be very small, but has to fulfill all your requirements. A schematic diagram will help you to arrange all the cables and network devices in a proper way. This wireless network diagram is made to describe the home-area network system. This diagram shows the typical wireless network organization in a private house or condominium. It consists from computers and gadgets that use wireless connections. The diagram is created using the ConceptDraw Computer Networks Diagrams solution. It is a rather common diagram that features icons depicting Wi-Fi point, router, media gadgets and periphery with connections and routes that show the flow of data. This sample shows the Flowchart that displays the architecture of SQL Exception Translation. This sample was created in ConceptDraw DIAGRAM v12 diagramming and vector drawing software using the Flowcharts solution from the What is a Diagram area of ConceptDraw Solution Park.